Before and After is an episode that should be more interesting than it ultimately is. There is no small irony in the fact that the one future constant suggested by Before and After would be gone by the third episode of the following season, while the generic tone of the episode’s future flashes would prove entirely accurate. In some ways, Voyager was a paradox. It was generally quite professional and sleek, the show’s polished exterior seeming a little too lifeless and sterile at times. However, this was all an elaborate and well-rehearsed illusion. 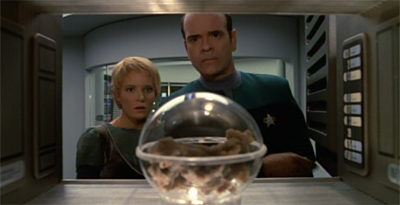 Behind the scenes, Voyager was a turbulent and chaotic piece of television. Those conversations and would tweak some of the future suggested by Before and After. Jennifer Lien would depart, and Kes would be retired. Jeri Ryan would be hired, and Seven of Nine would join the crew. Much like what had happened with Deep Space Nine, the planned third season cliffhanger would be thwarted and pushed into the fourth season to make way for a much more bankable story. On Deep Space Nine, Homefront and Paradise Lost were shunted for The Way of the Warrior. 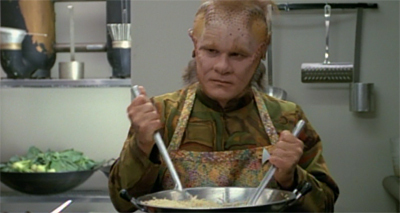 On Voyager, Year of Hell, Part I would be brushed aside for Scorpion, Part I. At the same time, it was clear that Paramount was wary and uncertain of what the future might hold for the franchise. Viewing figures had begun a decline that would continue until the end of Enterprise. The writers on Deep Space Nine had been instructed by the studio to add an existing character and focus on the Klingons early in their fourth season, hoping to shore up viewers. Similar discussions were taking place behind the scenes on Voyager, with the network and producers looking to spice things up on the series. 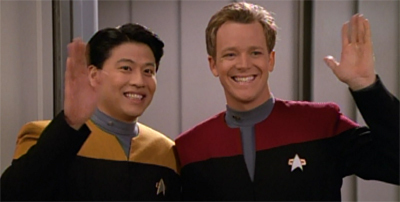 There is something to be said for the pulpier side of Star Trek: Voyager, the aspect of the show that plays like a cheesy sci-fi b-movie. Brannon Braga is very much the driving force behind this aspect of the show, as evidenced by his scripts for the belated Cold War body-swapping horror of Cathexis or the psychological nightmare of Projections or the trashy psychedelic terror of Cold Fire or even the weird evolutionary anxieties of Threshold and Macrocosm. These sorts of episodes often feel like they belong in a late night movie slot reserved for forgotten horror flicks from the fifties and sixties. Of course, Braga is not alone in this; episodes like Meld and The Thaw also fit the pattern. Of course, these episodes do not always hit the mark. Charitably, it could be argued that they land about half the time and misfire spectacularly about one third of the time. However, there is something strangely compelling about these episode. They feel distinct from what audiences expect from Star Trek. Even if they are arguably just an extension of late Star Trek: The Next Generation episodes like Sub Rosa or Genesis or Eye of the Beholder, they feel like something different from the show’s more conventional “let’s do archetypal Star Trek” plotting. Darkling is an episode that doesn’t quite work, but which is oddly endearing in its dysfunction. It is a ridiculous central premise executed in a deeply flawed (and occasionally uncomfortable) manner. However, there is something weirdly compelling about wedding the show’s science-fiction premise to gothic horror through the fractured psyche of a computer program.